European machine appearance and human oriented design,round corner frame box,H shape strong machine structure and high quality processing technique give machine more elegent and stable performance. First using stable and low noise balance driving hopper,effectively reducing the vibrating interference and improving the speed,with better supporting method for body structure,its center of gravity moves 150mm down compare with similar,and the entire height of machine reduced up to 220mm. Equipped with world famous brand parts like HBM sensor,WEIDMULLER connector,SIEMENS PLC,Rockwell(Allen-Bradley) PLC which can largely enhance machines stability and reliability. The high speed and accuracy AD mode is developed by TO-U,we are the first manufacturer to use Multivariate composite filtering technique in multihead weigher.It is with high dynamic response,stronger anti-interference,higher rate and better accuracy of data collection. 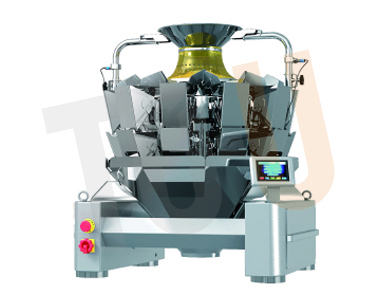 TO-U multihead weigher,MCU or PLC is for your choosing.